12 people died and 4,578 were injured in traffic accidents in New York City in April. Among the fatalities were 7 pedestrians, 3 cyclists and 2 motor vehicle passengers. The number of fatalities recorded last April is the lowest number of traffic fatalities ever recorded in April since Vision Zero started. Last year during the same month 20 people died in NYC motor vehicle accidents. In 2016, 2015, 2014 and 2013, there were respectively 14, 19, 21 and 15 fatalities. Sadly, the number of people injured in accidents in the city was higher in April 2018 than it was in April 2017. It wasn’t as high as in 2016 but it was higher than in 2014 and 2015 and also back at the level where it was before Vision Zero was implemented. While pedestrians and cyclists account for most deaths, motorists and passengers sustain most of the injuries. Motorists injuries continue to be on an ascending trend with a record number of 2,117 motorists injured last April compared to respectively, 1,922, 2,061, 1,363, 1,305 and 1,599 in 2017, 2016, 2015, 2014 and 2013. Distracted driving might be one of the reasons why this number continues to increase. Passengers injuries stayed below 1,500 for the second consecutive year in April. Globally the number of passengers injured has been on a decline since Vision Zero was launched. Pedestrians are the road users that are the most at risk of dying in traffic accidents in New York City and many of the Vision Zero initiatives have been directly aimed at protecting them. Seniors and children are the most at risk of getting fatally struck by a vehicle. Last April, 7 pedestrians died in an accidents in New York compared to 10 the previous month and respectively 6,7,5,8 and 11 in April 2017, 2016, 2015, 2014 and 2013. Since Vision Zero started the number of pedestrian deaths in April always stayed below 10. Similarly the number of pedestrian injuries stayed below 900 since Vision Zero was launched at the beginning of 2014. Last April 719 pedestrians were injured in NYC motor vehicle accidents compared to 927 the previous month and 713 in April 2017. While the graph below shows that the trend of pedestrian injuries is declining it is interesting to notice that the 3-month moving average of the “winter peak” of pedestrian injuries is gradually getting lower but the “summer dip” declined drastically from 2013 to 2014 and then stayed almost stable over the last 4 years. While the number of pedestrian accidents declines during the summer, the number of bicyclist accidents increases. As soon as the temperature rises and the sun comes out, more people are riding bicycles in the city. As a consequence the number of bicycle accidents also increases. 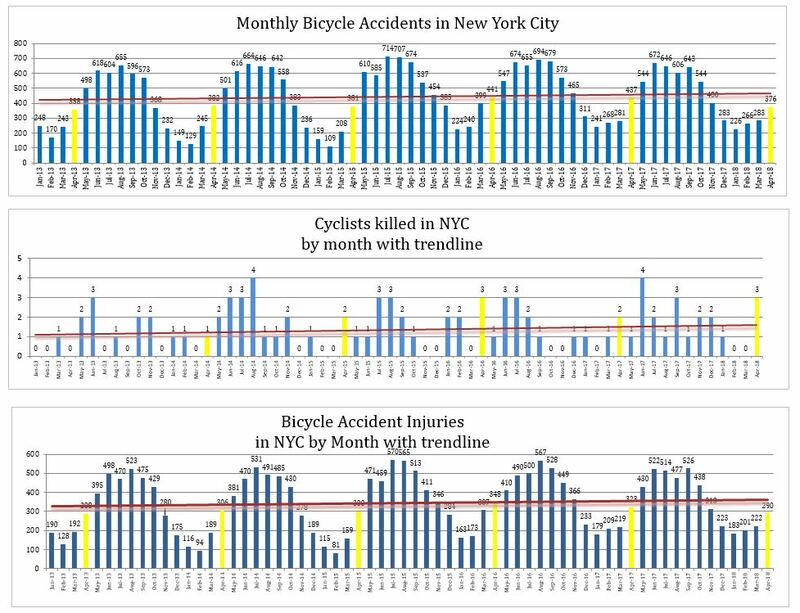 There were 376 bicycle accidents recorded in the city last April compared to 283 in March. This is the lowest number of bicycle accidents ever recorded in April since Vision Zero started. April 2018 was colder than usual. Therefore the decline in bicycle accidents may also be related to the not very bicycle friendly weather conditions. Sadly despite a lower number of accidents in April the number of bicycle accident deaths was at its highest in April with 3 cyclists fatalities recorded during that month. On a more positive note and despite being on a slightly increasing trend, the number of bicycle accident injuries was below 300 for the first time since 2014. 290 cyclists were injured last April compared to respectively 323, 348, 300 and 306 in April 2017, 2016, 2015 and 2014. Again the cold weather may have been a factor in this decline. Motorcycle accidents are usually at their lowest in April as road conditions are usually better than in the midst of the winter but it is still cold to be on a bike during this month. 49 motorcycle accidents were reported to the NYPD last April in New York compared to respectively 63, 40, 28 32 and 55 in April 2017, 2016, 2015, 2014 and 2013. Bus accidents continue to be on an increasing trend. Last April they were again above 600 with 605 bus accidents recorded during this month compared to respectively 585, 677, 600, 559 and 548 in 2017, 2016, 2015, 2014 and 2013. The number of truck accidents continues to be alarming in NYC and not much is being done to address this problem. Last April 1,399 truck accidents were reported in New York City compared to 1401 the previous month. In 5 years truck accidents went from 557 in April 2013 to 1,399 in April 2018. That’s almost a 200% increase.